GoPro today announced the availability of its new HERO3+ line of cameras, featuring a 20% smaller and lighter designs and a 30% better battery life than previous models. The already bijou, top of the range Black edition is now 20 percent smaller, with GoPro claiming that improved optics will see a 33 percent increase in image sharpness, with artefacts reduced by a factor of two. Other improvements include a new 1080 “SuperView” mode which converts footage from 4:3 aspect ratio into a more immersive 16:9 view, plus an auto-low light mode that will adjust the frame rate on the fly. Wi-Fi has also been sped up by 4x for super-swift transfer and playback of photos and videos from the HERO3+ camera via the GoPro App. The HERO3+ Black Edition camera has a suggested retail price of $399.99. Billed as packing a 2x faster image processor than the HERO3: Silver Edition, the new HERO3+ comes with 1080p60 and 720p120 fps video, all safely crammed into a new housing which makes up a 15% smaller and lighter overall package when camera is installed in the waterproof housing. The HERO3+ Silver Edition camera has a suggested retail price of $299.99. GoPro have also released a new set of mounts and an updated GoPro Studio 2.0. Scroll down for the press release for all the details. 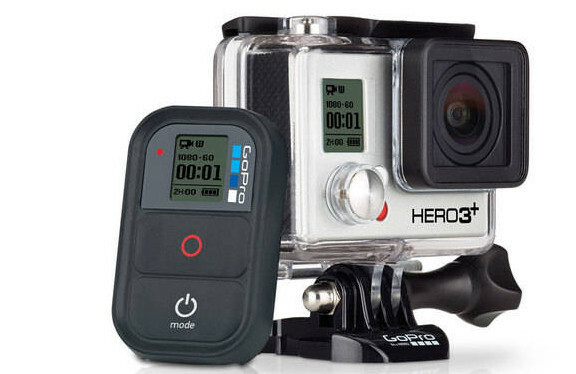 SAN MATEO, CA (October 1, 2013) ­­– GoPro today announced the availability of its new HERO3+ line of cameras, featuring a 20% smaller and lighter design and 30% better battery life than previous models. These upgrades, combined with an improved lens and convenient new video capture modes, produce the most advanced and easy-to-use GoPro, yet. In addition, GoPro announced several new mounting accessories that further enable immersive content capture during any activity. The HERO3+ line of cameras and accessories are now available at GoPro.com and at select retailers worldwide. GoPro is enabling people to capture and share life experiences in a way that was never before possible. Prior to GoPro, it was very difficult for anyone to capture content of themselves doing anything without having the help of someone else to film them. GoPro has enabled a new era of self-documentation whereby people can now easily wear or mount miniature ultra wide-angle GoPro cameras to record themselves doing just about anything, anywhere. The result is a surge of immersive user-generated and professional content made possible by the versatility and affordability of GoPro’s cameras and accessories. An average of three GoPro “tagged” videos are uploaded to YouTube every minute, and GoPro is used by the world’s leading production companies to help produce some of today’s most engaging film and television content. In addition to being the best-selling camera globally in consumer markets*, GoPro’s HERO3 camera has also been the best-selling camera to professional production companies, on a volume basis. The National Academy of Television Arts & Sciences recently awarded the HERO3 camera an Emmy for its contributions to filmmaking and television production. “We have used GoPro cameras in some of our biggest productions, like Survivor and The Bible. GoPro has allowed us to capture and share fascinating new perspectives that previously weren’t possible or were too costly, which in the end makes for better story telling. We are always excited to see what GoPro is working on next,” remarks award winning producer, Mark Burnett. “The HERO3+ illustrates GoPro’s commitment to innovation. We took the world’s best-selling ultra compact camera and made it better because we’re relentless in our pursuit of delivering the best possible user experience to our customers. We saw that we could make the HERO3+ significantly smaller and lighter while at the same time increasing battery life 30%. We saw the opportunity to design a sharper lens, so we did it–improving GoPro’s already highly regarded image quality. And we thought up exciting new features like SuperView, which enables the world’s most immersive wide-angle video. These are all features that we as passionate GoPro users want for ourselves, and we’re excited to share them with our customers around the world,” said Nicholas Woodman, Founder and CEO of GoPro. The HERO3+ Black Edition – The Most Advanced GoPro Camera Yet. The HERO3+ Silver Edition – 2x More Powerful. Jaws: Flex Clamp – A quick way to clamp your GoPro camera to a variety of objects. Use the optional opposable neck to achieve a wide range of camera positioning and adjustability. Jaws securely grips irregular shapes and super slim objects thanks to its innovative design. Junior Chesty (Chest Harness) – A smaller version of our adult-sized Chest Harness. Perfect for kids ages 3+, the Junior Chest Harness is great for capturing immersive footage of a child’s world from their perspective—from skiing and skateboarding to slides and swings. Headstrap + QuickClip – The QuickClip is a new accessory that now comes bundled with GoPro’s Headstrap. The QuickClip enables ultra-compact, low-profile mounting to baseball hats, belts and other objects ranging in thickness from 3mm to 10mm. While HERO3+ cameras and accessories make it easy to capture incredible footage, GoPro Studio 2.0 makes it easy to edit and share incredible videos. New to Studio 2.0 are GoPro Edit Templates–customizable templates of some of GoPro’s best videos made available for free to users. It’s as easy as picking out a GoPro video you like and dropping your own GoPro clips into the pre-made edit template. Killer soundtracks are included and all the edits are stylishly timed to the music by GoPro’s famous production team. Now anyone can easily create professional-looking videos, making it more fun than ever to GoPro. GoPro makes the world’s best selling and most versatile cameras, enabling people to capture immersive and engaging footage of themselves during their favorite activities. GoPro’s HERO line of wearable and gear mountable cameras are used collectively by more consumers, professional athletes, and video production professionals than any other camera in the world. Based in San Mateo, California, GoPro’s products are sold in more than 35,000 stores in over 100 countries worldwide and direct via GoPro.com. GOPRO® and HERO® are trademarks or registered trademarks of Woodman Labs, Inc. in the United States and other countries. All other company, product names are trademarks or registered trademarks of their rightful owners.